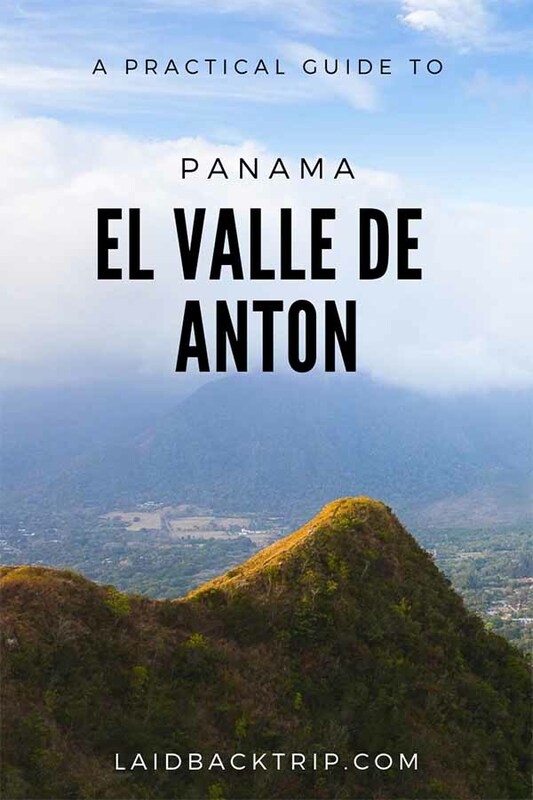 In this guide, we share our favorite hikes in El Valle de Anton, Panama and also tips on the best things to do in this village located in a volcano crater. El Valle de Anton, also known under the shorter and more familiar name El Valle is a small village only 2.5 hours drive from the capital of Panama, Panama City. You might think that you've already seen places like this before - a small town with great hiking possibilities, green hills everywhere you can see, hot pools, orchids or butterflies (these are in short things you can do in El Valle de Anton), but yet, El Valle de Anton is not the usual place. What makes it so different is the settings of the town as El Valle was built in a volcanic crater many years ago- actually, the crater is the largest inhabited volcano crater in the world. And the undeniable fact is, that the crater can be best appreciated from above during one of several hikes accessible from El Valle de Anton. That's why we have decided to focus on our three favorite treks we did in El Valle, but we will also cover other things you can do while enjoying the greenery in the beautiful valley of Central America. The Sleeping Indan Hike was the first trek we did after quite a long time, and we could feel we were off shape since we hiked almost every day in Patagonia about two months ago. Although the hike is short when we reached the top in less than an hour, it is quite steep. It is a popular sunset or sunrise trek, but we did it in the afternoon when the light was flattering, and the views from the summit overlooking the crater and hills around were beautiful and exaggerated by the fact it was just two of us and two local runners in the distance. La India Dormida Trail starts approximately 15 minutes walk from El Valle de Anton at Piedra Pinteda trailhead (you will see signs along the road leading you to the starting point). At the beginning of all hikes, we have done in El Valle, were ticket booths, and the price written on the board was between $3 - 5, but even though we visited the area when the summer season was in full swing, there was never a person collecting money. We assumed this was an ambitious plan, but people were not willing to pay money for every hike in the area, so they dropped the idea, but who knows. From the trailhead, the path to the summit is straightforward. You will pass a small waterfall and continue up (there are occasionally blue arrows on stones) until you reach the main viewpoint. The hike is supposed to be a loop, but at the entrance, there was a map with this option crossed out, so we returned the same way. And why the name La India Dormida alias Sleeping Indian? According to a legend, at times when Guaymi Tribe of Anton Valley fought against Spaniards, there lived a girl Luba, who fell in love with Spanish official, the enemy. When Yaravi, a member of the tribe saw it, he killed himself because he loved Luba. The girl was torn as she did not want to betray her tribe, so in a panic, she lost herself in the mountains where she died. When you look closely from the top, you might see a hill reminding you of a shape of lying woman's body. The Cerro Iguana Hike is equally long, or short if you will as La India Dormida hike, it takes about an hour to get to the top from where you can admire the crater and hills around from different perspective. The hike starts at the southwest corner of El Valle de Anton: there is a path and Maps.me app will lead you to the trail's beginning safely. Quite a long part of the trail goes on an unpaved road, so you can also cheat a bit and skip the less interesting part. As we didn't have a car, we walked all the way up. Follow the road until you reach a sign announcing the start of the trek (there is also a small concrete building on the left you must pass). From here, the incline is actually milder, and you will enjoy the hike through a grassy land revealing the views slowly. To get back to El Valle, you must walk the same way, but watch your steps when going downhill as stones on an unpaved road are slippery even under dry conditions. The hike to Cerro Gaital was the longest (four to six hours) and the toughest we did in El Valle de Anton area. The length of this trail pretty much depends on how you decide to reach the trailhead - if on foot or by bus. We decided on hiking, so it took us about an hour only to reach the trailhead. Use Maps.me app which proved to be reliable here. From the northeast corner of the village follow La Entrada del Valle road for three or four kilometers (depends on where are you staying) and then turn left (the turnoff is in the app). In case you are not adventurous enough or don't have time, we recommend you to take a bus as the walk from El Valle de Anton to the starting point was not that interesting, and we also had to walk through a couple of gates and private properties (luckily no strayed dogs) in order to get to the trailhead. The other and less painful way how to reach the trailhead is by taking a local bus with a sign La Messa on the window. The ride cost $1. Ask a driver to drop you off at Cerro Gaital trailhead. At the starting point, there is a building where you must sign in (you don't need to pay an entrance fee as of March 2019) and claim the reason for your visit - we noticed there were several people coming for bird watching. If this is your area of interest, visit the trail early in the morning. The first section of the trail leads through a mossy and dense forest, but it changes quickly as you will have to go through bushes for the longer part of this trek. Getting to Cerro Gaital requires a bit of strength and physical conditions because there were sections we had to climb up using our hands or ropes. It was not terribly difficult, but definitely challenging and we wouldn't recommend doing this trek when wet as rocks and climbing sections could be extremely slippery. To be honest, views from Cerro Gaital were a bit limited because of trees and bushes around, but what we enjoyed the most this time was the physical activity and the feeling we could savor the fresh air. Apart from hiking, there are more fun things to do in El Valle de Anton you can easily enjoy. We found the hiking trails almost abandoned despite visiting during the dry season, but expect you will have to share other, more easily accessible attractions with others. We have mentioned and described our three favorite hikes which are close to El Valle de Anton, but if you don't have enough, the area has numerous treks in case you are still keen to explore the area more thoroughly, and you have time to spare. Among treks close to El Valle you could consider trying belong Cerro La Gaita, Cerro La Silla, Pozo Azul Waterfall Canyon, Cerro Turega or Cerro Picacho. El Valle de Anton is home to the Orchids Center (La Orquideria) which gathers more than 150 species of national plants of Panama, orchids. Before visiting, it's worth checking if flowers are in bloom or not as it could greatly affect your visit. The entrance fee is only $2 as the center is run by a non-profit organization. They also have an accommodation Orquidea Hostel on the grounds in case you would prefer to stay even closer to these beautiful flowers. The best time to visit to see orchids in bloom is during the wet season, but the garden is open all year round. Panama as a country has hundreds of waterfalls, and El Valle area has some true gems in its possession. The best waterfall close to El Valle de Anton is the easily accessible 35 meters high cascade El Chorro Macho. The waterfall is located in a private rainforest, so be prepared to pay $5 as an entrance fee when you do the visit independently. You can also take a guided tour connected with a canopy tour which cost around $65, and it is a price we wouldn't pay for it. The waterfall is pretty, not spectacular though - do not expect Iguazu Falls for sure. You can take a dip in a small pool under the fall surrounded by rainforest, but check the conditions before your visit. In the dry season (January to April) the waterfall can completely dry out, or you can see a very little water running down. The cascade is about 2 kilometers north of the town, so it takes 20 to 30 minutes to reach the entrance (and from here it is a short walk to the falls), or you can take a taxi for $2-3. When looking for a place where to relax, you can pay a visit to hot springs right in the town. El Valle's hot pools is a nice little place where you can for $4 take a dip in one of four pools (one larger and three small ones) plus put a mud facial mask. This place is quite small and can get crowded, so if you are up to pools and do not insist that the water must be hot, you can visit natural pools with small cascades not that far away from El Valle de Anton, Pozo Azul. Pozo Azul Waterfalls is basically a series of cascades flowing down and creating pools calling for action - either swimming or jumping. To reach Pozo Azul, you can either drive by yourself, take a tour for $15 per person, hitchhike or take a bus to Penonome, here catch a bus to Pozo Azul and walk from there for about 45 minutes. The falls and pools are on the private property, and you must pay an entrance fee $1 (it should be included in your tour when not visiting independently). The number and the kind of attractions within a small area reminded us of two destinations in Ecuador, Banos, and Mindo. Both of them were also small towns with lush greenery, waterfalls, pools and different species of animals. In El Valle de Anton, you can visit a butterfly garden called Butterfly Haven where a knowledgable (and English speaking) staff will educate you about different species of butterflies, caterpillars and about their life cycle. The butterflies are the most active in the morning, so try to plan your visit accordingly. The entrance fee is $5, and the property is open every day but on Tuesdays. If you want to see an endemic frog to El Valle de Anton, the Golden Tree Frog, you have two options. First, visit a small El Nispero Zoo, a center with a task to protect this endangered species or secondly, go hiking and try to look it up on your own. The easiest way is to go to Golden Frog Inn and ask the staff to show you the entry to Golden Frog Hike where you can search for the bright yellow frog by yourself. In case you won't be successful, you would at least enjoy panoramic views over El Valle de Anton and stunning flora along the trail. Rooms in El Valle are quite pricy, especially on weekends when herds of visitors from Panama City arrive to enjoy well-deserved time off. For us, it was hard to find a budget accommodation as it was carnival time and everything was booked up, and we had to pay double than usual for a room. Budget | Bodhi Hostel & Lounge - The most popular option in town for budget travelers have everything you might need (wifi, kitchen, patio, and garden) plus it has a laid back atmosphere. Mid-range | The Golden Frog Inn - Nicely appointed rooms, beautiful settings, outdoor pool, and free bike rentals are the best features of this hotel. Luxury | Los Mandarinos Boutique Hotel & Spa - This hotel is the best choice for travelers seeking a luxurious retreat after all day out exploring the valley. El Valle de Anton is off the Interamericana Highway, but thanks to its popularity, the village is well-connected. As of matter of fact, the town is known as a retreat for wealthy Panamanians, so the road is in good condition, but there are lots of turns though. From Panama City, there are frequent minivans running approximately every 30 minutes from the Albrook Station the ticket cost $4.25 (you cannot buy the ticket in advance), and the ride takes 2.5 hours. If you are traveling to El Valle from any other place than Panama City, ask the driver to drop you off at Las Ulvas - it is the intersection where cars either continue along Interamericana or turn to El Valle and here wait for any bus or rather minivan going that direction. The ticket from here should cost a maximum of $2. When you need to leave El Valle de Anton, you can either retrace your steps to Panama City or wait at Las Ulvas intersection for a bus going to your destination, for example, Boquete (you must go to David first), Bocas del Toro islands or Santa Fe.